FOURTEEN-YEAR-OLD Henry Vervoorts saved the day at one of Nottingham's best-known amateur theatres - by stepping into a crucial role at less than 24 hours' notice. 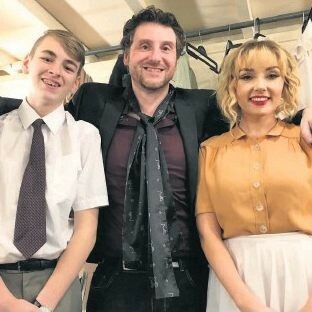 The Rushcliffe School pupil took on the key part of a young newspaper vendor, during the Lace Market Theatre's production of Tennessee Williams' play A Streetcar Named Desire. Henry played the role in Saturday's matinee and evening performances, after original actor Raj Singh had to drop out because of a family bereavement. In a short but important scene, the young man is kissed by much older lead character Blanche Dubois. The show's director Wayne Parkin had been faced with cutting the scene, before Henry - who previously had a non-speaking role - offered to step up. "I was nervous, but excited," he said. Henry spent Saturday morning learning his lines - and his performances went off without a hitch. After the show, the teenager won praise from both the audience and his fellow cast members. Lead actress Danielle Arnie Easter added: "Henry was very brave - a true professional." Saturday was the final performance of the lay's week-long run. All seven shows were soId out.